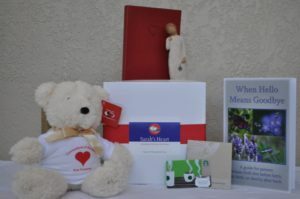 Sarah’s Heart offers support to help San Antonio families honor life shortened by miscarriage, stillbirth, and early infant death. In addition to support groups and counseling, we provide Comfort Boxes. In 2017 Sarah’s Heart provided 200 Comfort Boxes. We now support 4 area hospitals: Methodist Main, University, Brooke Army Medical Center and North Central Baptist by providing comfort boxes.